Nature's Way has been creating wellness products since 1969. They are not only pioneers of herbal and nutritional science, but also boast many accomplishments. They were the first major certified organic producer, first to manufacture products with state of the art pharmaceutically licensed facility, and first to fund major third party organizations to responsibly disseminate health information and ensure quality. Nature's Way EFA GOld is the highest quality hemp seed powder, and one of nature's richest sourcesof protein, fiber & essential fatty acids. Directions Add 2 scoops to a favorite juice, smoothie or other beverage. Can be sprinkled on cereals and yogurt, or added to a muffin recipe. Refrigerate after opening. 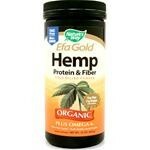 Ingredients Ingredients: Organic Hemp Powder (seed). Nature's Way EFA GOld is the highest quality hemp seed oil, and nature's richest botanical source of Omega-3/6/9 essential fatty acids. Directions Take 1 tablespoon (15 mL) 1 to 2 times daily. may also be used in salad dressings, dips and spreads; on bread, rice and pasta or stirred into yogurt, cottage cheese, juice or cold beverages. Keep refrigerated. 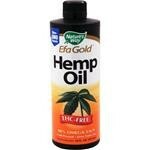 Ingredients: Hemp Oil (seed).